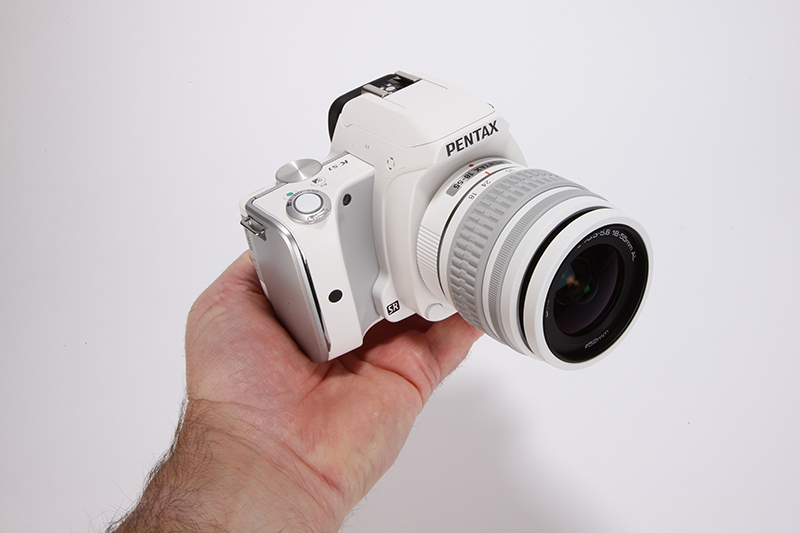 Although the central chassis of the K-S1, the part that houses the mirror box, viewfinder prism and lens mount, looks as if it could have been lifted from any Pentax DSLR, the shape of the body is quite different. It has a futuristic appearance, but the sort of future that we imagined in the 1970s, and I couldn’t help but think of the Imperial Stormtroopers from Star Wars when I first saw the white version tested here. Without the curvy handgrip that you would normally associate with a DSLR, you would expect the grip of the K-S1 to be uncomfortable, and while it doesn’t fit the hand quite has snugly as other cameras, it is deep enough, allowing the forefinger to comfortably rest on the shutter button. On the top-plate at the rear sits a control dial for aperture, shutter speed or exposure compensation, depending on which shooting mode you are in. The metallic wheel is a nice piece of design, which sadly can’t be said of the main directional control on the camera’s rear. Sitting around this directional control is a shooting mode dial, which requires a firm push to shift through the different modes. I understand that it is important that this dial doesn’t accidentally shift modes too easily, but it is simply too stiff and clunky. The directional controls themselves are also a little fiddly to use. They require a very precise press due to their size and shape. However, all of the other buttons are nicely positioned and easily pressed, so it is just a shame that the main control of the camera is fiddly to use. There are various parts of the camera that illuminate, including the main control buttons on the rear. This is genuinely useful when shooting in low light. The handgrip also has an illuminated strip consisting of five separate lights. These lights act as a countdown timer, or to make you aware of when face detection or a remote release is being used. If the lights aren’t for you, they can be dimmed or turned off completely.